Justice Sandra Day O’Connor. Julian Messner, 1983. 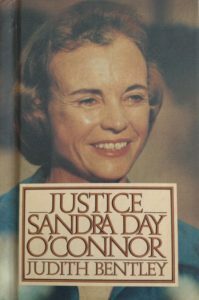 Sandra Day O’Connor was an inspiration–the first woman to serve on the United States Supreme Court. I began writing this biography during her first year on the Court-1981. I interviewed her in Washington, D.C. and visited her family on a remote ranch near the Arizona/New Mexico border. Little did I know the influence she would wield, serving until she resigned to care for her ill husband in 2006. This biography covers the first 51 years of her life. It is no longer in print but may be found on used book sites.